The Astor CB-1000 bidet seat attachment is a little different than the products we reviewed. It’s not a toilet seat, so it doesn’t replace your seat. It’s an attachment, so it installs under your existing toilet seat. Yet it provides the exact same function as a bidet seat, or specifically a non-electric bidet seat (as it doesn’t have any electrical heating components). An attachment may be the perfect product for you if you want to try out using a bidet at little cost, or if you want a simple product that simply washes. The first thing we’ll review is the design of the Astor bidet toilet seat attachment. We’ll be looking at the appearance, dimensions, and general build of this product. The Astor bidet attachment has a dial that’s located on the left side (if you stand facing the toilet). This means you’ll need to make sure you have enough clearance to install this attachment. It should work for you if you have a 4-5 inch clearance between the side of your toilet and the wall or other object. Naturally, when you sit down, the dial will be on your right side. This toilet seat attachment is white. It comes with all the parts you’ll need to install the attachment, including hose and adapters. All you need is a screwdriver to install it and less than 30 minutes of your time. This bidet toilet seat attachment will install with any two-piece toilet, elongated or round. You don’t need to worry about the dimensions of this attachment other than the clearance on the side of your toilet seat. On the dial, you can set the water pressure from low to high. The water pressure for this Astor attachment is strong enough that you’ll rarely need to set it to high. When the water spray is turned “off” the nozzle will retract automatically. As an attachment, there isn’t much to say about the appearance because most of it is hidden under the seat. The dial isn’t exactly the most beautiful thing we’ve seen, but we appreciate the simplicity. The only feature this bidet and all the other non-electric bidet seats offer is the water spray. So we’ll talk about how it washes and the water pressure. The thing about using a bidet attachment like this is that there is no water heating. That means the water will come out at whatever temperature it is at the time. So during the winter you’ll likely be blasting yourself with cold water, and that “shock” can stay with you for days. On the contrary, this bidet attachment is quite pleasant to use on hot summer days. We say “blast” because the water pressure with this bidet attachment is mighty. So be careful not to turn it up too high. The spray hits the right spot and because of the good water pressure you really feel clean. Why the Astor CB-1000 bidet attachment? Picking the right bidet can be a difficult decision. There are many products on the market (standalone bidets, bidet seats, and bidet attachments) and it’s not easy to see what features you get with each product. To help with your decision, we put together some reasons why the Astor might be the one you’re looking for. There are no major drawbacks that we can think of with this bidet attachment, other than the fact that it doesn’t have a water heater. But this is what we knew coming into the review, since it is a non-electric product. If you’re in the market for a non-electric bidet seat, then consider the Astor CB-1000 attachment. 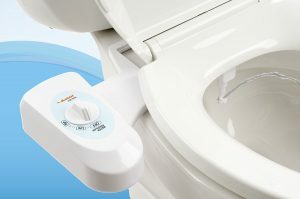 It performs just like the non-electric seats and you don’t have to replace your whole toilet seat using an attachment. It’s a simple product that works. It’s available at a great price. It’s simple to install – there are no electric components. And it’s simple to use. If you don’t know whether a bidet is right for you, the Astor attachment is the best product to try out. All in all, it’s hard to go wrong with the Astor.